This quote is from C.N. Bovee who was a writer and friend of Washington Irving who wrote the famous "The Legend of Sleepy Hollow." His quote rings true in the individual I am about to expose in this post. This person lives a delusion. The delusion is so great that the individual has built an online career on it. "But atheism that consists entirely in vacuous arguments afloat on oceans of historical ignorance, made turbulent by storms of strident self-righteousness, is as contemptible as any other form of dreary fundamentalism. And it is sometimes difficult, frankly, to be perfectly generous in one's response to the sort of invective currently fashionable among the devoutly undevout, or to the sort of historical misrepresentations it typically involves... These are attitudes masquerading as ideas, emotional commitments disguised as intellectual honesty. However sincere the current evangelists of unbelief may be, they are doing nothing more than producing rationales--ballasted by a formidable collection of conceptual and historical errors--for convictions that are rooted not in reason but in a greater cultural will, of which their arguments are only reflexes." How true are Bentley's words! They describe very well the blog postings of the individual I will reveal in this post. The blog masquerades as intellectually sound and scientifically literate; however, a close inspection of the material will produce a conclusion quite to the contrary. It makes one wonder if the author ever graduated from a university. The prose and context used; the argumentation is poorly articulated. To an educated person, it actually presents atheism in a negative light. However, to the uneducated, the blog presents itself as being academically and logically sound. In all honesty, the content on the blog would not pass the scrutiny of scholars and academics whose life work is philosophy, rhetoric, biology, physics and theology. This is unfortunate indeed. It makes me wonder if this person is even an atheist or just looking to profit over the gullibility of them. Ever since the internet became public and AOL was the dominant service provider with its chatrooms and instant message service, there have been a class of users commonly called "trolls." A troll by definition is, "a person who sows discord on the internet by starting arguments or upsetting people, by posting inflammatory, extraneous, or off-topic messages in an online community either accidentally or with the deliberate intent of provoking readers into an emotional response or otherwise disrupt normal on-topic discussion"(Indiana University: University Information Technology Services, 2009-05-05). Most atheists on Twitter and other social networks can be classified as such. However, there is one in particular who obviously suffers from mental illness to the point of taking internet trolling seriously and making a career out of it. 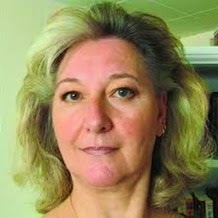 This person goes by the online pseudonym "Rosa Rubicondior" which derives from a Japanese anime series and also a poem. @Sacerdotus @andyjkmak She is one of the worst dishonest debaters around - yet claims she hates them on her bio. Good tweets - bad attitude. For a few years, "Rosa Rubicondior" used Twitter to harass Christians, Muslims and even other atheists who did not share her views as you can see in the tweets above of an atheist who experienced "Rosa Rubicondior's" bipolar episode first hand. This kind of behavior is anti-social in nature and comorbid with what is called "Online Disinhibition Effect." Online Disinhibition Effect causes people to feel uninhibited online. He or she will have a more open sense of expression and do things that he or she normally would not dare to do in real life, or offline. They are often rude, offer harsh criticisms, dislike criticism; demonstrate anger, hatred and make threats. These people do this because the anonymity the internet offers gives them a "cover" to do these things without revealing who they are. This empowers their anti-social behavior because they feel they cannot be caught. The latter behavior is comorbid with Online Disinhibition Effect and is called "Dissociative Anonymity" (Suler, J. (2004). Since a person with Online Disinhibition Effect can hide behind screen names, pseudonyms and the like, they feel powerful. 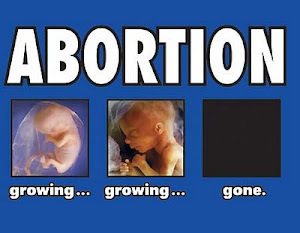 They can become whomever they want. This fantasy can take them anywhere in their warped minds. MTV's show "Catfish" reveals some people with this disorder. They use the internet to lure victims into their web of lies by pretending to be something or someone they are not. These people do this because of lack of self esteem and other manic disorders that are underlying in the person's psyche. She began to defame me by relying on heuristic representativeness in order to piece together "evidence" and by doing so, creating an identity in order to place that identity on me; of a high school minor. She immediately claimed that she had "exposed Sacerdotus" with her post which is nothing more than conjecture and fabrications made to look presenting. These posts only convince the ignorant and those who fall into the conjunction fallacy and not intelligent readers who critically think about what they read and question any claims made in what was read. Some of her followers believed her lies and till this day repeat them by harassing me and other Catholics online. Anyone can join me on Skype or Google hangouts to see I am not the person "Rosa Rubicondior" believes I am. I have nothing to hide. As a future priest and former atheist who worked in many scientific fields with renown professors, I am a public figure and known in those respective communities. She knew once people saw I am not the child she thinks I am via my passport, they would ignore her. She does not want to show herself to the world for whatever reason her distorted mind adopts due to her Dissociative Anonymity disorder. Nevertheless, her plan to remain anonymous has come to an end as you see her here in just a bit. After her suspension, she even returned to Twitter as "Rosareerected" which give a hint of the sexual deviancy that parades in her warped mind. She then returned as "RosaResurrected," "Saucerdotus" and several other names desmontrating her need to be relevant which is a sign of Narcissistic Personality Disorder. All of these accounts were of course suspended after Twitter was informed. She still uses some which I and others have been monitoring, including atheists. She is now full time on Facebook posting her lies and fallacious blog posts. "Rosa Rubicondior" is so delusional that she continues to add on her blog Twitter accounts which are not even mine! Her paranoia further demonstrates her mental instability. Moreover, anyone (including atheists) who question her blog posts or her intentions will automatically be identified as "Sacerdotus" or "Manny." It is just absurd at how some atheists even pay attention to this sick person. This is why I surmise that atheists who follow this lady and defend her are in fact her, or sock puppets which she uses to defend herself by pretending to be other atheist individuals. It would not surprise me at all if this was the case. Her psychosis is demonstrable in her prose and online behavior. Luckily I have her IP address when she contacted me and will proceed from there. Thankfully, "Rosa" is not very bright and is not shy with her abusive behavior. She gets every chance to try to defame me or bring me up in a post. She does this of course in order to bring in hits to her blog. As of lately, some atheists such as David Viviano have attempted to ride on the wave of my popularity in order to garner attention for themselves. While this also brings more attention to my work, it also does a disservice to "Rosa" and David Viviano. Their attempts to ride on my popularity has allowed me to view their apparent scams regarding online donations. Oxfam representatives notified me that no one named "Rosa Rubicondior" ever donated to their charity. They also disputed the amount and claims made on the "Rubicondior" blog. 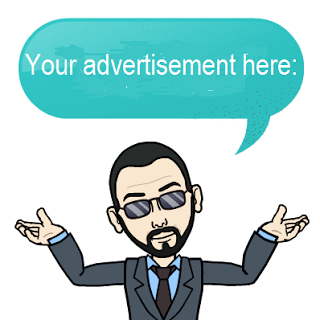 You can inquire as well and will receive the same response. I will continue to press this matter as well as the Viviano matter of donations with both Oxfam and the IRS. The reason why is because I do not want innocent atheists to be fooled into donating to these sketchy individuals or anyone else without verification. If "Rosa Rubicondior" provides better evidence that she does donate adsense funds to Oxfam, then I will call down my investigation. Screen shots with photoshop work does not cut it as evidence. Similarly, if Viviano can demonstrate the intention of his mendicant behavior on twitter and elsewhere, then I will not pursue the investigation with the IRS. A few individuals have questioned my own request for donations. I believe these individuals are sock puppets of "Rosa," nevertheless, I am glad they are questioning. They should also question any solicitation done by atheists to other atheists as well instead of questioning me just for the sake of deflecting from my questioning of "Rosa/Oxfam" and Viviano's request for money. Let us be fair here. Those who donate to my work get a message explaining how to report their donations to the IRS for tax deductible purposes. Moreover, as a member of a religious institution in the United States of America, I am not required to show how donations are used under the law unless goods or services are exchanged which is not the case here. If anyone has noticed, I did restore my url domain name which was expensive due to the fact that it is a premium url domain name. 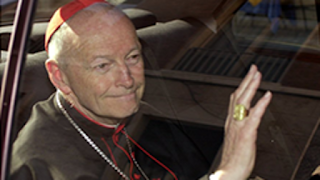 In an ironic twist, thanks to "Rosa Rubicondior" and others who write blogs or tweets on me, the name "Sacerdotus" has become popular with search engines raising the value of the url sacerdotus.com. That being said, if I lose it again, then it will be even more expensive to reacquire! Rest assured I will try my best to keep the price I got it for now and not have to pay any increases in value. 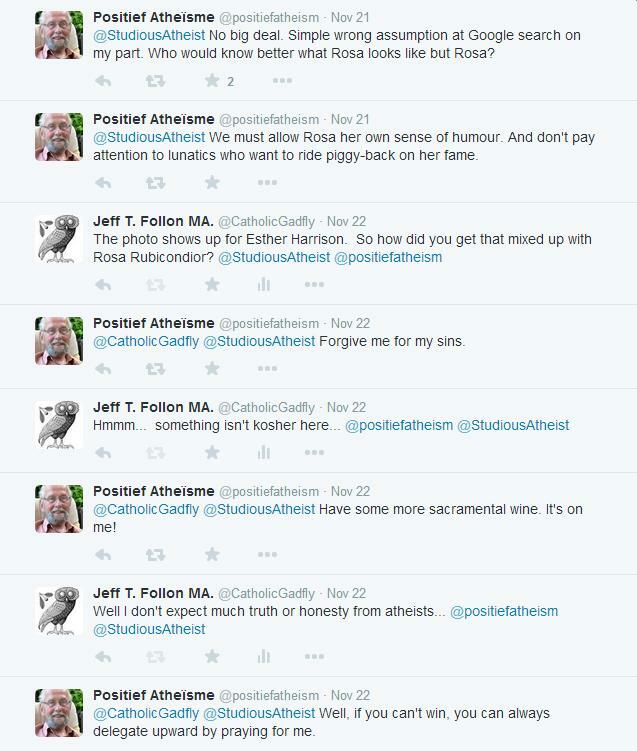 Atheists and others need to be careful with "Rosa Rubicondior" and other scams out there. "Rubicondior" has demonstrated publicly her anti-social behavior and is capable of anything as we can see with her many posts defaming me and someone named "Manuel" who she thinks is me. Ironically, a few atheists called her out on this claim. One even provided documents from the high school in the Bronx "Rosa" claims I went to. 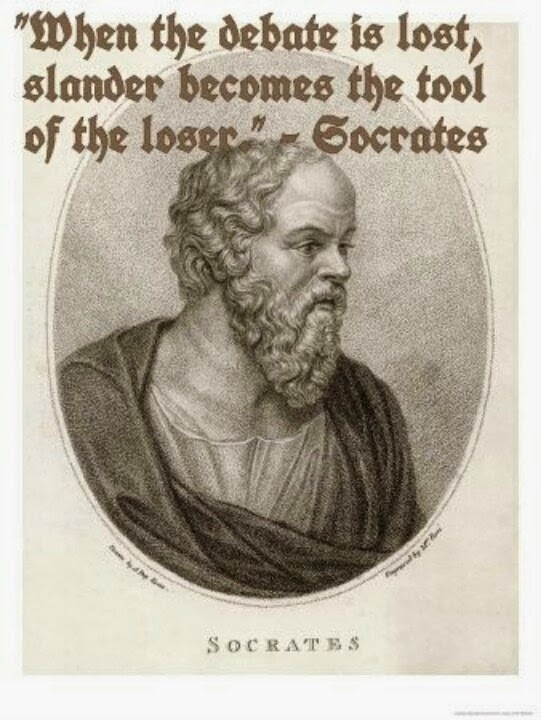 He too had been labeled "Sacerdotus" and "Manny" for being a real atheist and not believing anything unless evidence is presented. While I value free speech and expression, I feel that people like "Rosa Rubicondior" go too far when they resort to defamation and posting libelous content. What does she get out of lying about me and making claims that I am "Manuel" when her information is conjecture and the schools she mentions all attest that no such person named "Manuel" attended classes in them? Luckily, her nation, the United Kingdom has passed tough laws regarding internet trolls and cyber-bullying. Offenders can face up to 2 years in prison if convicted (see: http://www.bbc.com/news/uk-29678989). In light of this new amended law, I am working with friends in England to proceed with a case there against "Rosa Rubicondior." Being in America does not prevent me from using the court system of an alien nation. 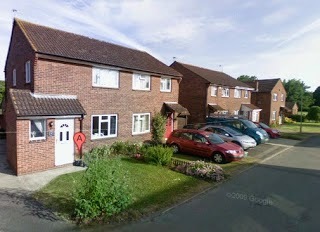 She lives on 6 Thistlecroft Close in Oxford England. I know this because it was verified and she also posted it on my blog which makes it public and excuses me from any breach of Google's policies regarding posting private information. Moreover, I also have her IP address, photo and other information which are also public. Some of you may be thinking, "Sacerdotus is going too far, he should let it go." I have contemplated it because she obviously got my information wrong, but as long as this person continues her lies; and if I do not do anything about it, then I would be an accomplice to her bad behavior. She will most likely do it with someone else who gets the best of her. It is sad that a simple request to have fun debate turned into this ridiculous back and forth charade. This is testament to the low emotional intelligence "Rosa Rubicondior" has that she feels the need to start and continue this "battle" over nothing. As a Christian I am called to forgive; however, being that she posted defamatory content against me and possibly a child, I must do the right thing and pursue it legally now that the United Kingdom passed a law that effectively prosecutes cyber trolls and bullies who misuse services such as Twitter, Facebook and Blogger in order to defame others. The case should be easy to prepare since "Rosa Rubicondior" has made her libelous statements publicly and promotes them. The intent to abuse, defame is there. Moreover, she has others promoting them including other residents of the United Kingdom who also would be charged as accomplices via the Malicious Communications Act. Thank God I have friends, both Catholic and Atheist who have been secretly documenting everything. I have the information needed to pursue a case in the United Kingdom against her, a guy in Kent, as well as in America in regards to a man in Connecticut, Minnesota and other states. These people think they are anonymous, but they have no idea how public they are. A simple filing at the clerk's office in the court brings about a lot of things which can be done without anyone realizing it. Google, Twitter, Facebook are not above the law. When pressed, they have to provide information requested of them. I will pursue the matter as long as the defamatory content remains. One can see in the dark cold eyes, fake smile and stiff upper lip the attempt to hide the chaos in this individual's warped mind. What senior citizen picks a fight with a well educated former atheist in his 20's? Seriously "Rosa Rubicondior" what were you thinking? It is Halloween and I took the old lady mask from "Rosa Rubicondior." Hopefully this revelation will be of use to those who wondered who this disturbed individual who suffers from anililagnia really is. This post is not meant to defame "Rosa" or anyone and is merely the story and it happened before me. Author's note: I will update this as more interesting information of this strange person comes along. 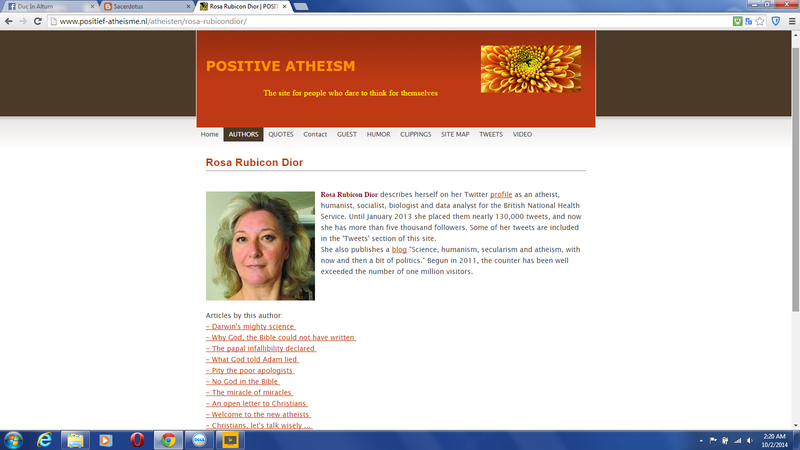 Page of atheist bloggers that shows up on Google Images using "Rosa Rubicondior"
On the right, you click "visit page" and it will take you to the site that lists several atheist personalities and bloggers (http://www.positief-atheisme.nl/atheisten/rosa-rubicondior/). A biography of "Rosa Rubicondior" is provided in a different language (use Google translate to change it to English) as well as a list of her blog postings. One can also contact Peter to verify which one of my atheist friends did. STEP 4 Shout AHA! I got you "Rosa!" and stick your tongue out at those who defend this fraud. "Rosa Rubicondior" aka Esther Harrison recently wrote a post attempting to dismiss this revelation. She tries hard to deflect from her real identity. However, it is clear that her name is Esther Harrison. This is knowable due to Peter van Montfoort 's search for an image of her online using that name. How so? 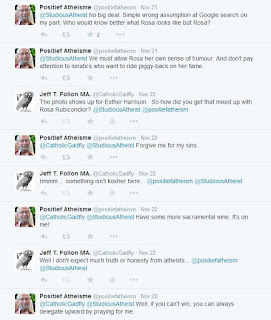 Well when Jeff (Catholicgadfly) inquired about Peter's "mistake," Peter went silent on this matter and began to deflect which speaks volumes to the name Esther Harrison being that of "Rosa Rubicondior." Do you delete the comments are are they all too embarrassing for you to let you occasional reader see them, Manuel? You have my name wrong Esther. My academic record has my name. You can verify it. Had you bothered to fact check the info someone gave you, then you would know this. Nit picking random info online and creating a narrative is not good detective work. It is conjecture. I do not delete comments. I post those that follow the rules posted on the page. "Thank you for reading and for your comment. All comments are subject to approval. They must be free of vulgarity, ad hominem and must be relevant to the blog posting subject matter."